Jenna's 6th birthday party is coming up the weekend after Halloween and, interestingly, she's chosen a Halloween theme for it. Hurrah because the shops are full of Halloween stuff to buy! The planets are not always so serendipitously aligned, though - a couple of years ago, she threatened to ask for a Valentine's Day party. In October! Good thing she soon gave up that idea. Yes, a Halloween theme, a few days after Halloween, is much better. Of our three girls, Jenna probably has the strongest opinions about things in general, but especially on things that are important to her - cupcakes, rainbows, cookies, the way grilled cheese sandwiches should be prepared, and her birthday parties. Just agreeing on this theme, for instance, took weeks, and was not without crying and fighting. Also, I eventually gave up discussing the details of the crafts and games and decorations with her because she'd say, "My ideas are better than yours!" Whoa. I am continually amazed at how different my girls are and, by association, how different the party-planning process for each is. Eventually, with Jenna's party, I began to be sneaky. I designed all the elements of the party on my own and then showed their completed outcomes to her. As expected, she was thrilled, and I learned another valuable mothering lesson: "Do not expect 5-year-olds to visualize anything that isn't right in front of them to see and touch and get excited about. Ditch the brainstorming and just surprise them." So... Halloween-themed birthday parties.... I'm going to share some of those projects here because you might enjoy making them for Halloween itself, if not for your own Halloween-themed birthday party, should you also have a Jenna living under your roof. 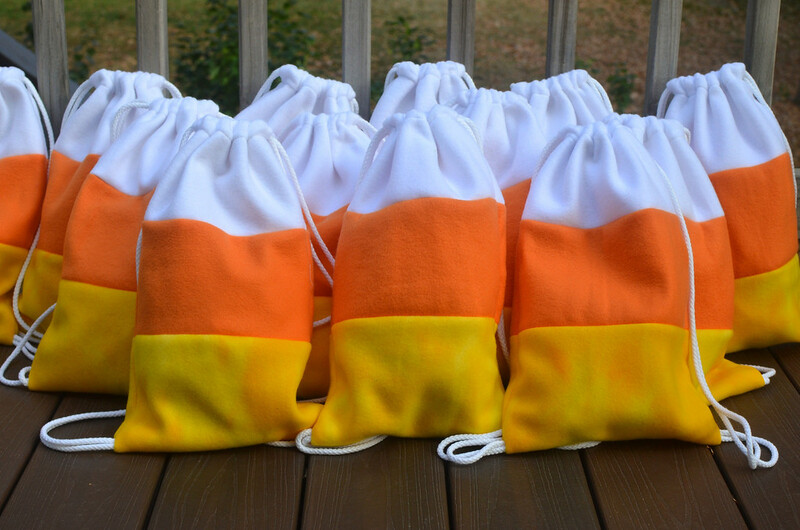 This first one is a candy corn backpack, which is the goodie bag for Jenna's guests. omit all hardware altogether and instead use the simplest possible method to attach the cord-straps to the bag. Faster, cheaper, easier, on all three counts! 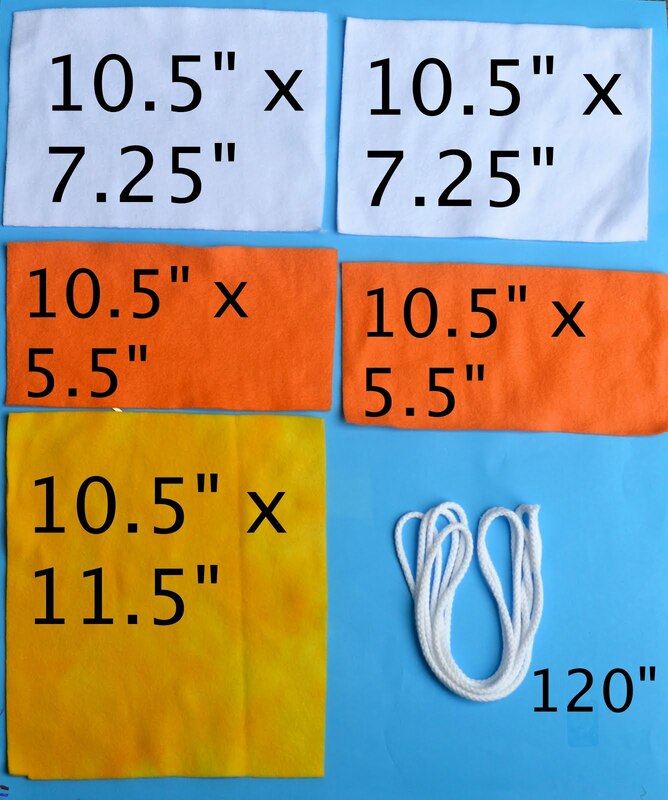 2 pieces of white fleece 7.25" x 10.5"
2 pieces of orange fleece 5.5" x 10.5"
1 piece of yellow fleece 11.5" x 10.5"
1 piece of cord, 120" long, cut into two 60" lengths. Mine was 1/4" in diameter. 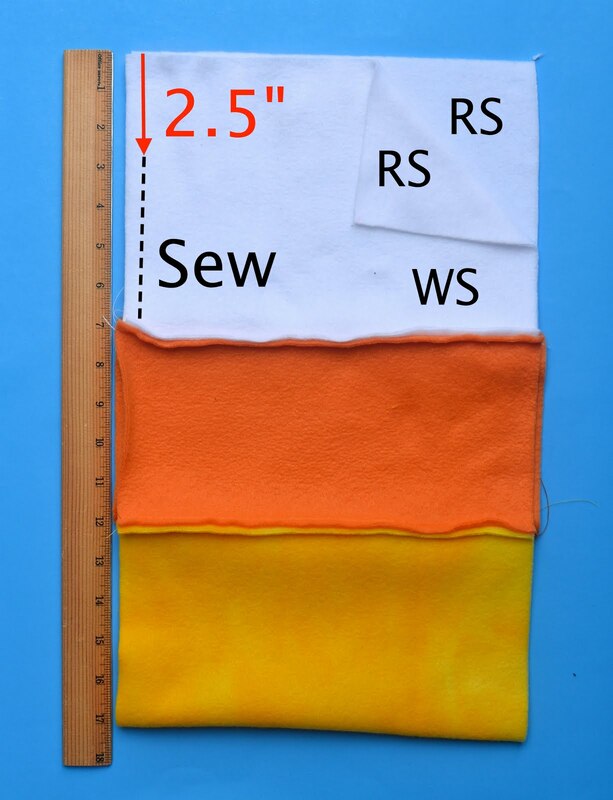 All fabric dimensions include 1/4" seam allowance (SA). 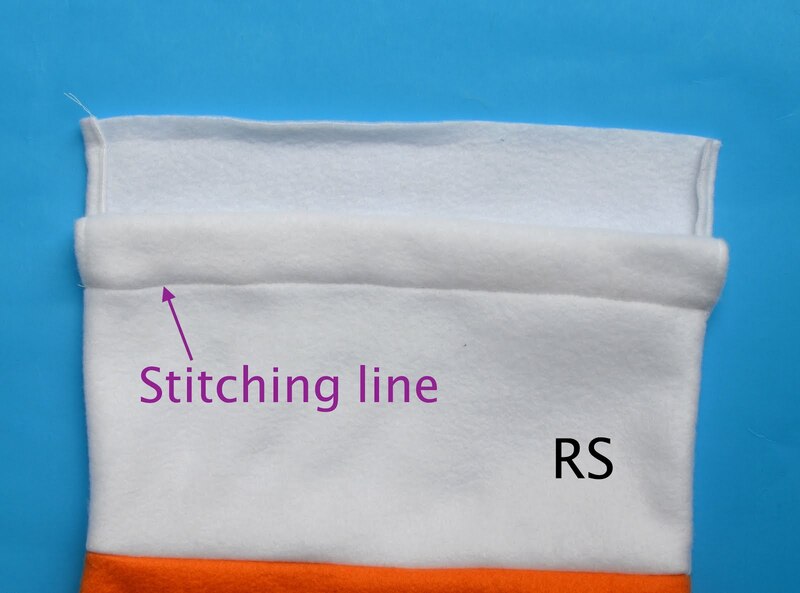 Keeping in mind that all the 10.5" edges are the widths of the bag, sew together the five pieces of fabric in a patchwork strip as shown below. 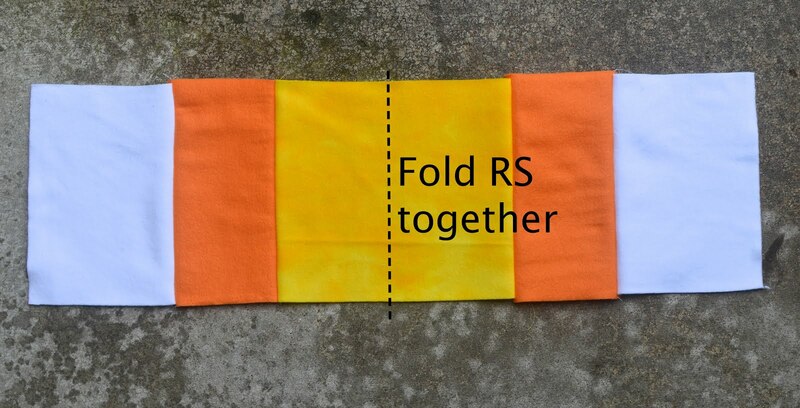 Then fold the entire strip in half, RS together, so the opposite white ends meet. 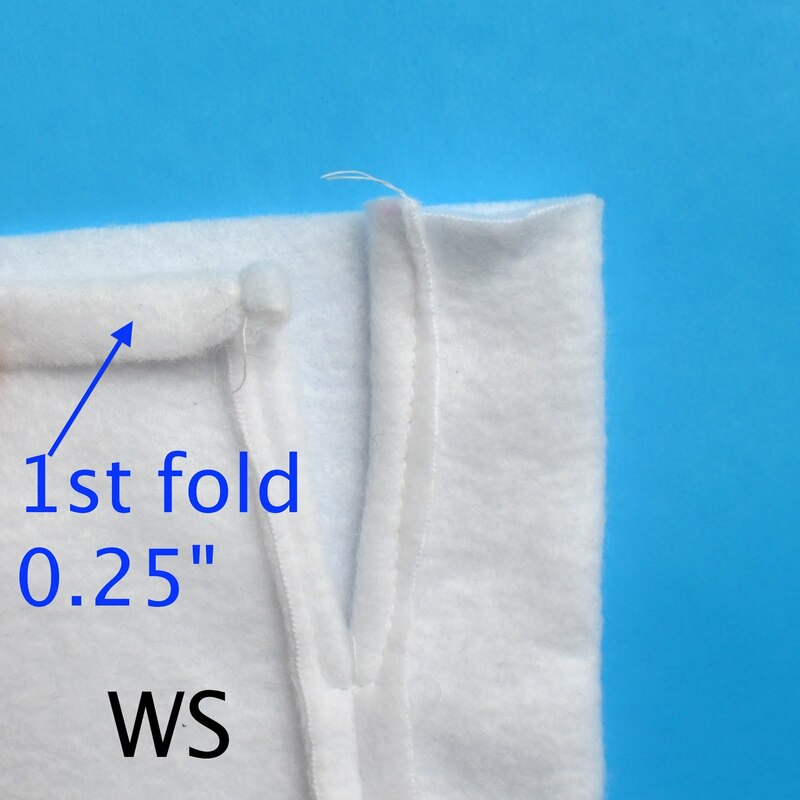 Measure from the top edge of the white piece, a point 2.5" down along the side seam. This will be the opening for the drawstring cord channel. 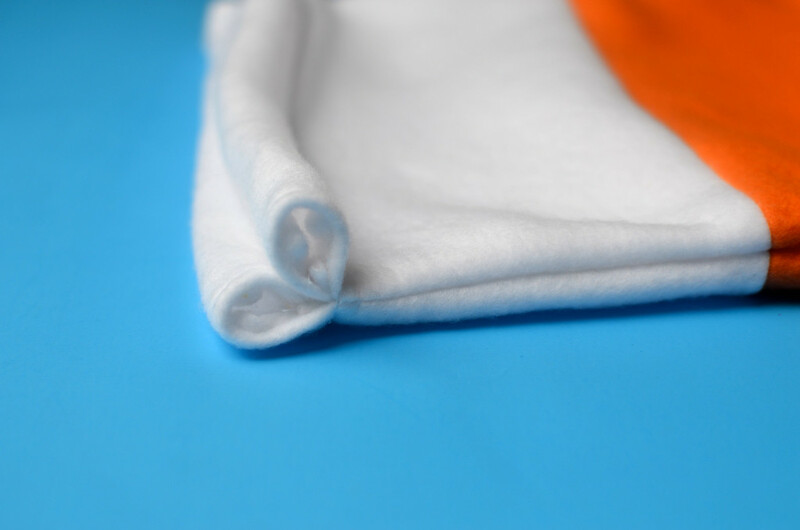 Beginning at the white-orange seam, sew up towards that point. 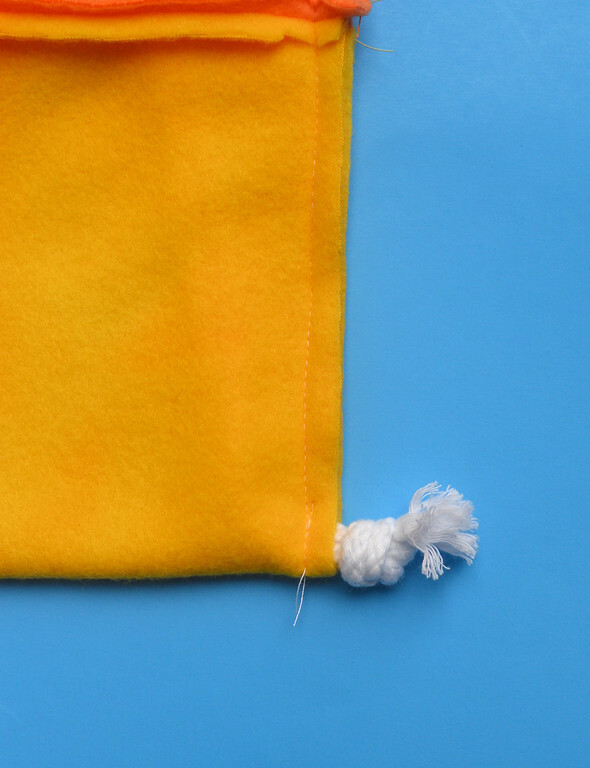 The yellow and orange sections of the bag along this seam will remain open until the last stages of the construction. 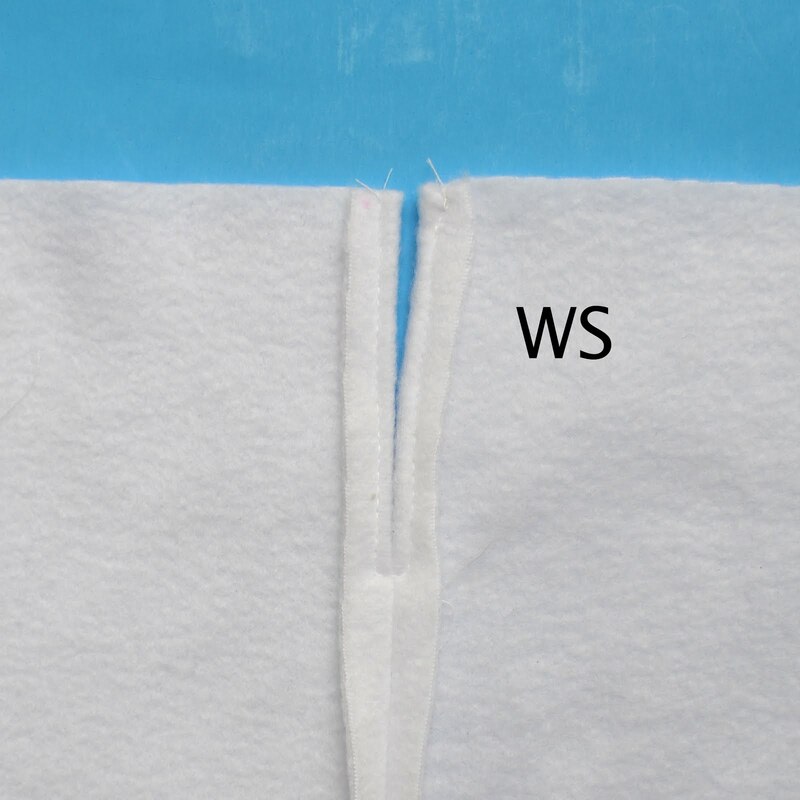 Flatten out this seam and, on the WS, sew the SA down around the opening to make a faced slit. 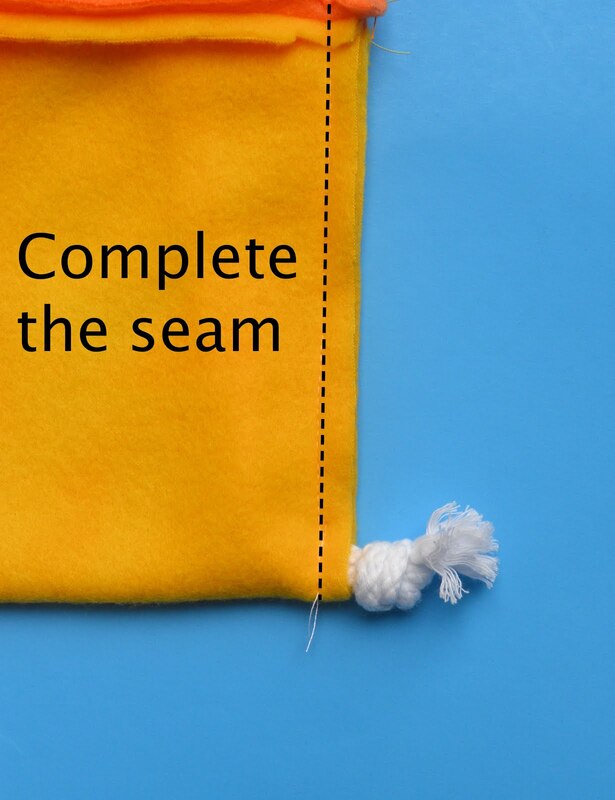 Repeat steps 2 and 3 to make a slit along the other side seam of the bag. 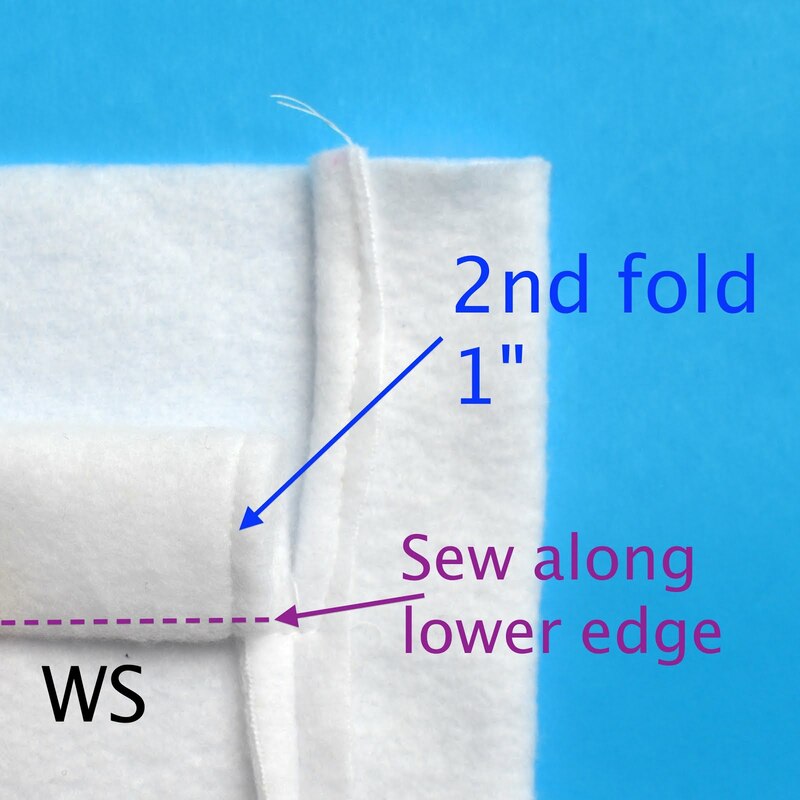 and then make a second fold 1" down, again to the WS. 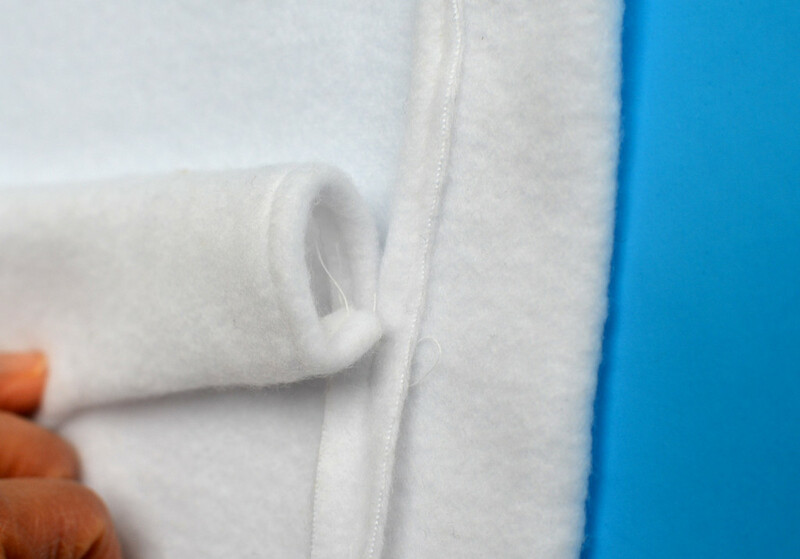 Sew along the lower edge (be careful to sew only through this layer of white fabric and not through to the other white piece; use the free arm of your sewing machine if it helps) to make the channel. This is another view of the two folds, showing the channel formed. This is the completed channel on one side of the bag. Obviously, when you are sewing this for real (and not only for tutorial photography), you wouldn't need to stop when you reach the end of this channel; you'd continue folding and stitching all around the entire bag to make both channels on both white pieces, in a continuous circle around the mouth of the bag. 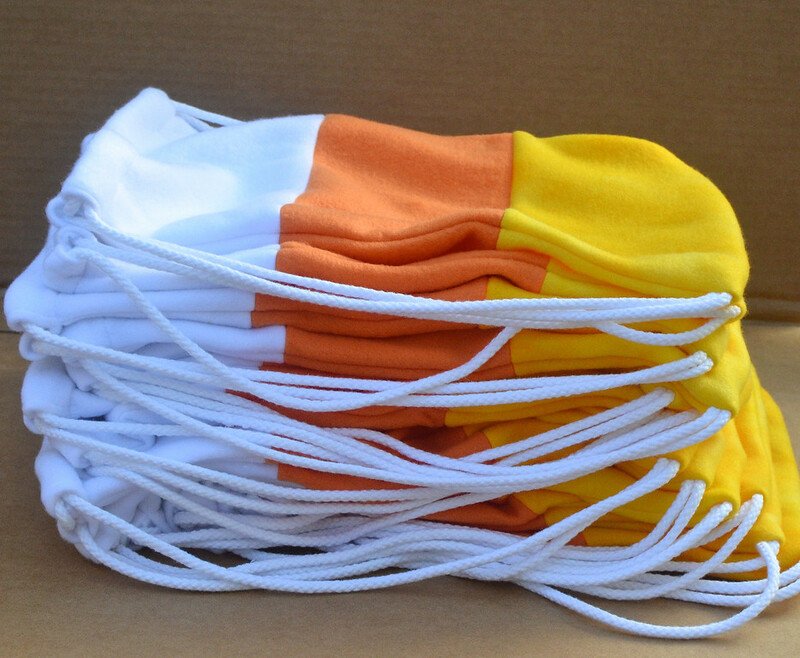 Here is a view of the two channels of the bag, completed. 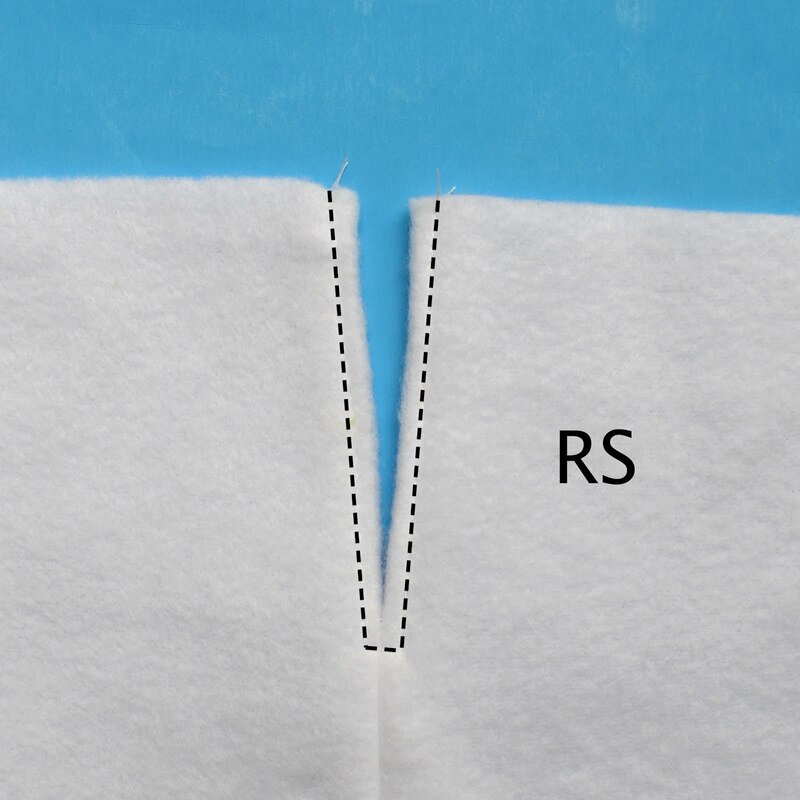 Now cut the cord into two lengths, each 60", and thread one length through the opening of the channel on one side seam. In this case, let's call it A. I used a safety pin. Thread the cord all the way around the mouth of the bag, until it re-emerges again at the same point (A). Ignore point B (the other opening). 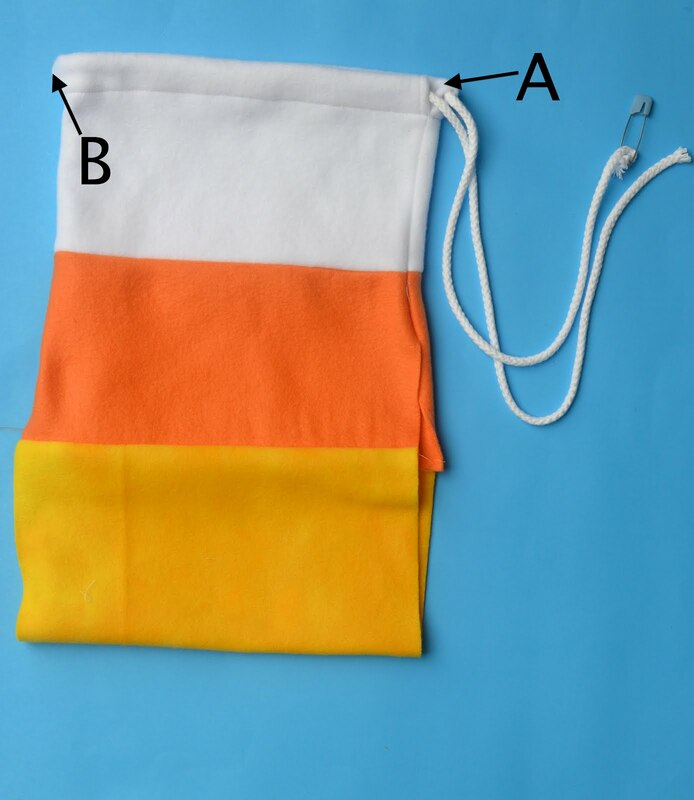 Notice also that the side seams are incomplete- the yellow and orange regions of the bag are open. 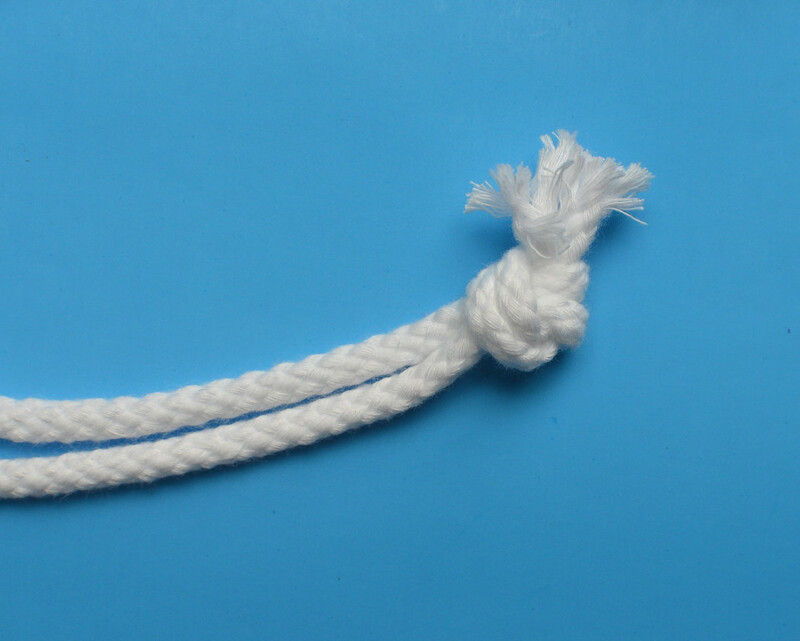 Tie the two ends of the cord together in a knot, to make a complete loop of cord. Repeat Step 6 with the other length of cord, this time inserting it into the other opening (B). The two cord-straps are now ready for insertion into the side seams of the bag (black arrows in the photo below). 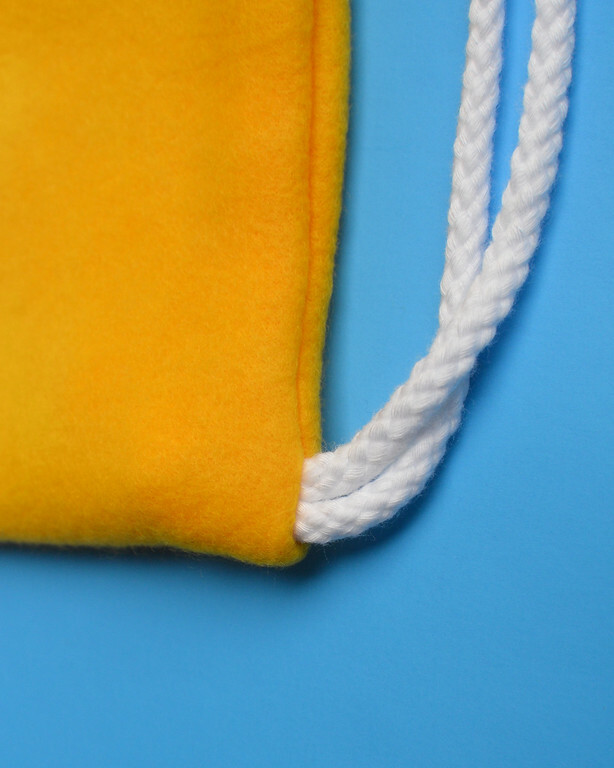 Turn the entire bag inside out and push the knot of the cords out through its corresponding side seam. Position the knot close to the bottom of the bag. Now complete the side seam, beginning from the same white-orange boundary as in Step 2, and sewing down to the bottom of the bag, securing the knot within the seam in the process. Repeat for the other side seam of the bag. 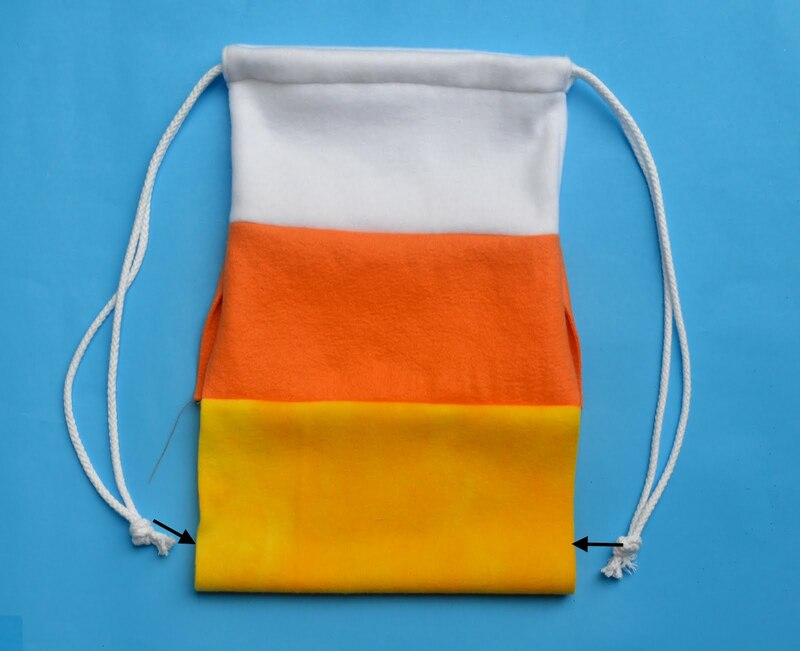 Turn RS out - the drawstring straps are secured to the bottom corners of the bag without the need for grommets, rings or fabric loops. 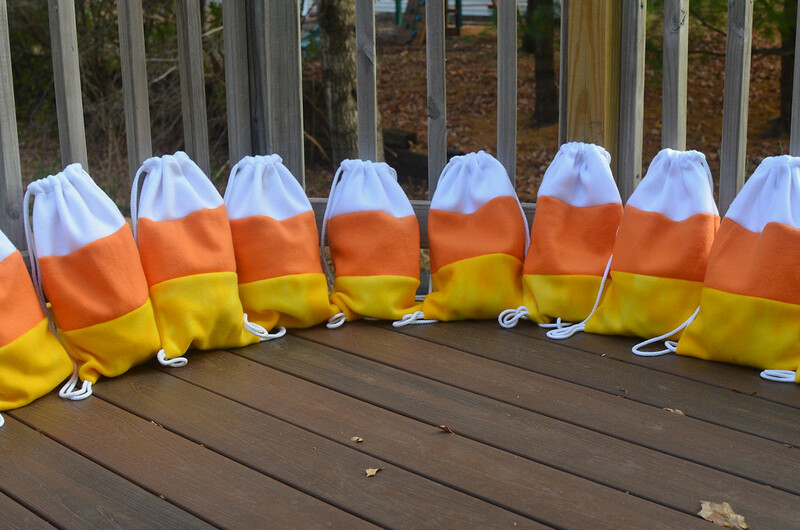 My only regret is that Jenna's party is after Halloween itself - or these would have made cute trick-or-treating bags! As usual, what a wonderful job! You are so creative and giving. 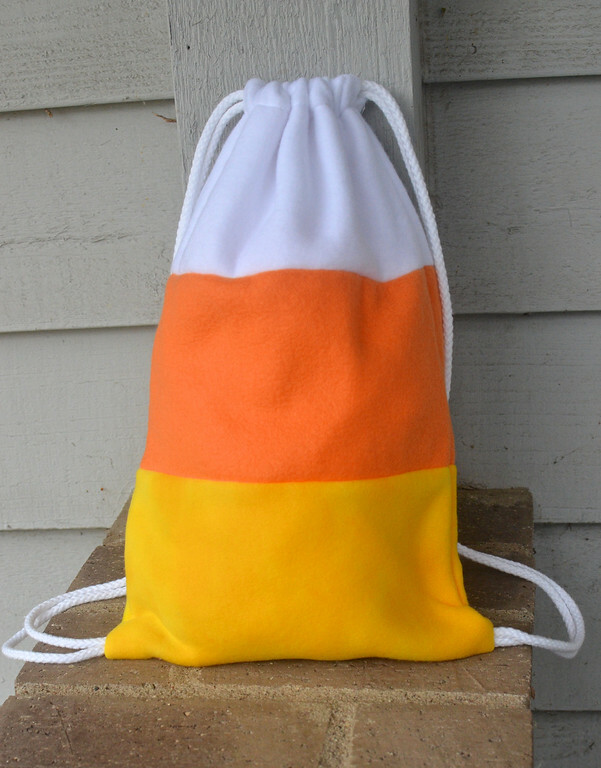 As an aside, I think candy corn must be an American thing - here in Canada, I never see candy corn in the stores (expect maybe in old-timey candy shoppes in the tourist areas). 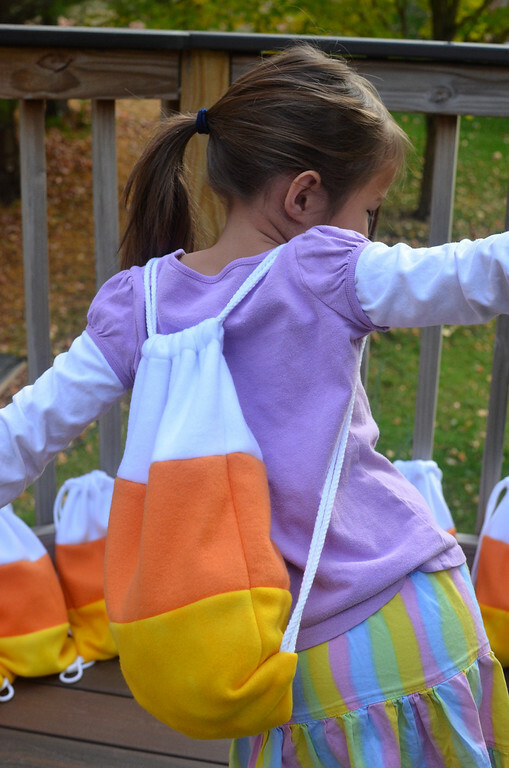 I think I may have tried candy corn as a kid (in the '70s), but not in a long time. 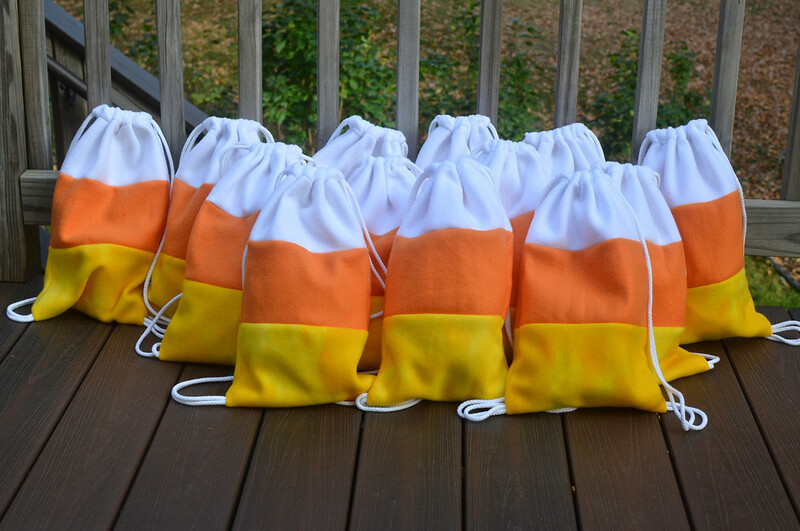 Is it a popular treat to receive in the States at Hallowe'en? I love them! I have a Jenna as cute and opinionated as yours. Hopefully I can "work" her birthday plans as gently as you did. 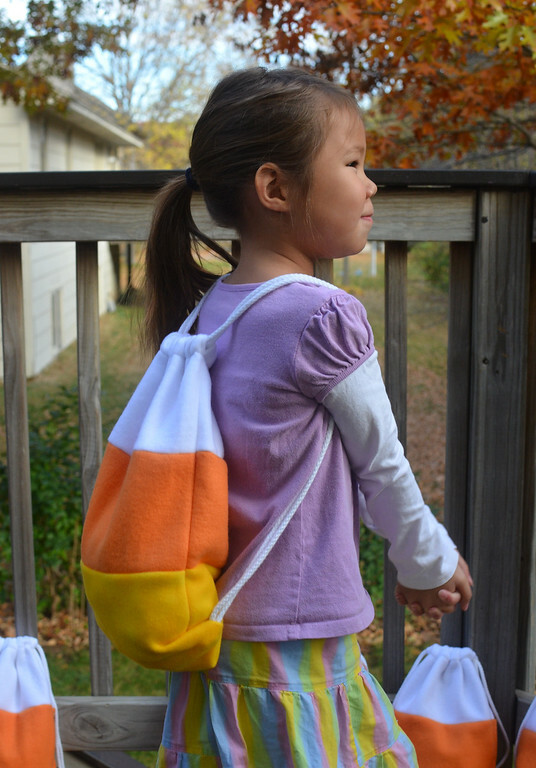 Thank you for the bag tutorial as well as the mothering tutorial! You rock. 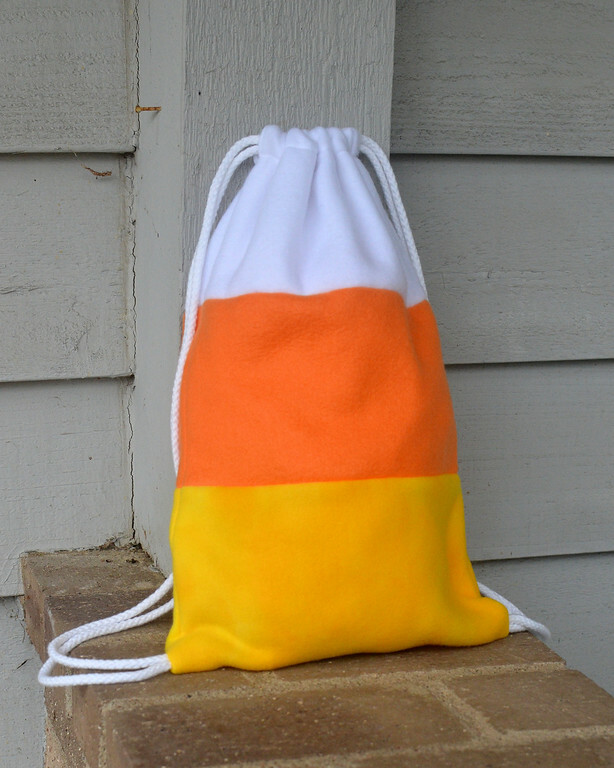 I have been wanting to make a bag like this for awhile. They are so great. I want to make mine in a brocade fabric because I don't have a five year old! Thanks for the tutorial. You Creative Soul! Another WOW and a THANKS. I made bows and marshmallow arrows with a church youth group (12 & 13 Year old girls). What fun they had! Our theme for the night was stretch yourselves and aim high! Thanks for the wonderful ideas and tutorials! What a great idea. I have a birthday party the weekend after Halloween too. Couldn´t get my daughter interested in the Halloween-theme. She decided, she wanted a spy party. So I´m goning to make these backpacks for the spy-tools. Already bought some convenient fleece blankets. Instead of cord, I´ll try T-shirt yarn. Will post the results on my blog. Thank You! 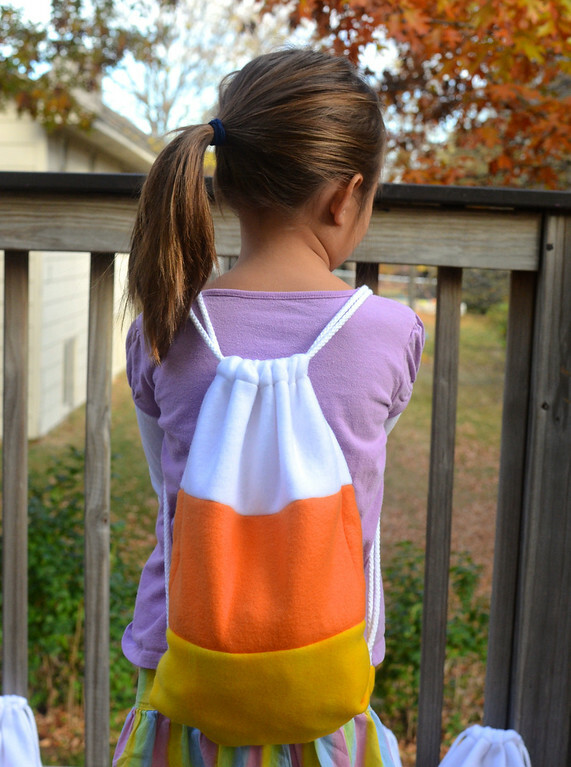 Just posted my version of the candy-corn-bag. Thank you so much for the tutorial. It was really fun to make them. I used a link to your tutorial. Hope that it is OK. I´m not used to the rules of blogging. I hope our parties will both be a success. OLA LIER,ACHEI TUDO BEAUTIFUL,MAS COLOCA UM TRADUTOR PARA NÓS BRASILEIROS,RSRS,VAI!!??BEIJOS.VALÉRIA. What a lovely tutorial! Once I have finished making one, I will post it in my blog and put your link so that others can make one, too. Thanks so much for taking the time to provide this lessons & sharing them with all. Wooden Food Sets Now In The Shop! Wooden Sets In The Shop Tomorrow!